Last week I wrote about the apparent lack of interest in sports nutrition in the swimming world (here). It surprised me that I received far more than the usual number of comments (in person, on various discussion forums, email, etc.) about this post. Most were agreeing with the situation, while a couple were providing me with nutrition information links I had not previously found (and which we admitted were not all that useful). But I also received some sensible requests asking me to share some of our team’s nutritional information. In addition, iMadgen Nutrition has an ebook (here) for swimmers containing a ton of useful information, including various recipes to make it easier to get more protein into the diet during the day. As a team, it’s fantastic to have this information at our fingertips, but I have to admit that even for us, the uptake on nutrition advice is slow. In the spirit of taking this seriously, this year the team paid for one-on-one assessments with Kevin for all of our competitive swimmers, because we just weren’t confident that swimmers / parents would agree to pay for this themselves if given the choice. And even with it being free, we still have quite a few families who have not yet booked an assessment. On the bright side, we presently have about 1/3 of our Junior / Senior swimmers now showing up to practices with a whey protein / dextrose drink, and that number is slowly growing. There is one part of the one-on-one assessment that is particularly helpful. The athlete describes their meals throughout a typical day, and the amount of protein is estimated. As an example, we may find out that they have 5 g of protein at about 7 am, another 15 g at noon, and 30 g at 7 pm. Kevin feeds this information into a muscle synthesis graphing program he developed, and its spits out this. 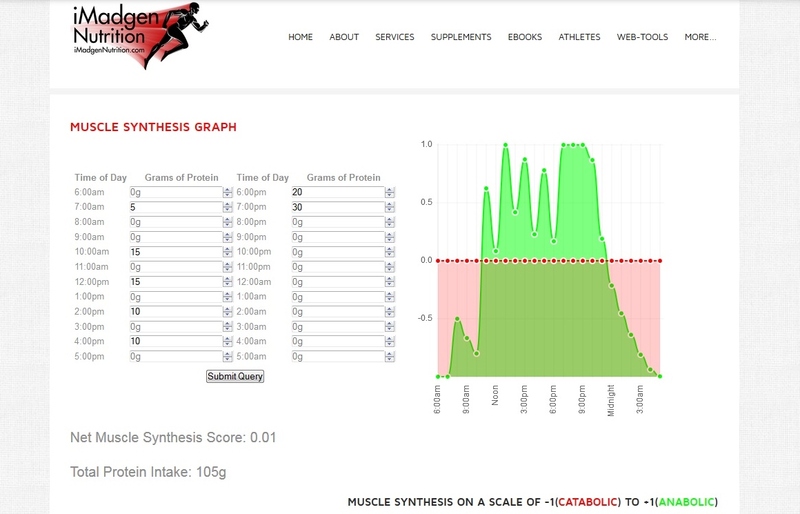 As you can see, the athlete is catabolic for most of the day including the afternoon practice and post-practice periods, with a net muscle synthesis score of -0.47. This is not an ideal situation at all. Kevin then discusses with the athlete various strategies of getting more protein at key times in the day. Let’s assume in this case we can get another 15 g at 10 am, 10 g at 2 pm, a further 10 g in a protein/dextrose drink during practice, and 20 g in a post-practice drink. Here’s the new muscle synthesis graph. Now we see that the athlete is anabolic for much more of the day, including the key times of during and after practice. The net muscle synthesis score is now a much better +0.01, and this leads to better adaptation to training and faster recovery. With the national swim organizations not taking a role, there’s not a lot of good, readily available sports nutrition information out there. But there are a lot of good sports nutritionists who can help. With sports nutrition possibly representing the next big untapped area of potential swimming improvement, it’s worth your time to find one. And then be prepared to work really hard to convince people to implement their recommendations. Next Post Can Short Swimmers Compete at the Highest Levels? It appeals to common sense that your body would be better able to use protein once it needs it to rebuild after swim practice, but I don’t think it holds up under a microscope. My understanding is that the studies that show increased strength and recovery with protein timing didn’t control for total calorie and protein intake. So suppose two guys are doing the same workouts and eating the same things for breakfast, lunch, and dinner, but one has a protein shake before and/or after. The one with the protein shake(s) achieves better gains and says it’s because of the timing, but really it’s because his absolute daily nutrient intake is higher. In other words, Kevin isn’t going to make gains because he gets more protein at key times in the day, but because he gets more protein period. In the first example, he’s getting 50g of protein, and in the second, 105g. The evidence suggests that if you took that initial 50g and spread it out throughout the day (or take the 105g and condense it into his normal meal schedule), you wouldn’t see a change in muscle gain/maintenance/recovery. That being said, it can be hard to keep up with calorie and protein requirements during heavy training, and not everyone can stomach 2,000 calories per meal. Read up on Christian Bale’s diet when bulking up for Batman, or Chris Evans’ for Captain America– as a gluttonous lover of food, even I think it sounds miserable trying to constantly stuff that much chicken/steak/protein into your stomach. Spacing out the intake throughout the day may help swimmers to more comfortably meet their dietary needs, so it certainly wouldn’t hurt to have some extra snacks or shakes… I’m just not entirely convinced that the actual timing matters as long as they have room for it and it doesn’t make nutrition a chore. Anyway, thank you for writing this, and for the other articles you post on this site! I do the sports nutrition for the Tritons so I thought I’d give a response to this. First off, I don’t disagree with anything you just said, per se. But I do think you may have missed the point of some of this. Rick did exactly what a coach is suppose to do when he comes across an important issue that he is not qualified to handle, in this case sports nutrition. He contracted out to a qualified sports nutritionist. This blog is his account of the work I am doing with the team, and I think he represented it very well. Rick nor I have ever said that total nutrient intake is not important. If you read the link above to “Prioritizing nutritional components”, you’ll see that I believe that getting adequate nutrient intake overall comes first and foremost. In most cases protein requirement falls between 1.5-2.0g/kg body weight. Like you said, the protein intake doubled between the two examples, and this lead to the largest effect. No one is saying that distributing inadequate amounts of protein differently would be an effective strategy. However, it is not realistic for an athlete to consume 105g of protein during breakfast, so of course protein distribution becomes a factor. Similarly, If all 105g of protein was consumed for dinner after training, would this be effective for training performance? No! athletes would be training in a fasted state! Protein distribution is a natural consequence and realistic solution to the real problem of athletes not getting enough daily protein. The reason why I typically add in protein rich snacks and recovery drinks is because I found it provokes a long lasting behavioural change, opposed to the alternatives. There is a reason why many athletes don’t get a lot of protein at breakfast. Telling them to eat a larger breakfast won’t change that. Also, adding more protein to dinner, where most athletes are willing to eat, will not change a poor practice before hand. Think about it this way, if you don’t eat for 2 hours before a 2 hour training session, then that is already 4 hours since the last time you ate. Instead of waiting to go home and cook dinner before eating and turning that 4 hours into 5-6 hours, why not get a quick recovery shake in? I’ve read that meta-analysis, http://www.jissn.com/content/10/1/53, before and it is well done. But don’t think that there is no evidence out there supporting increased MPS efficiency from a repeated-style of eating. For example, “20 g of whey protein consumed every 3 h was superior to either PULSE or BOLUS feeding patterns for stimulating MPS throughout the day” (Areta et al. 2013). Lastly, Don’t be that guy that brings anecdotal claims like “Christian Bale’s bulking diet” to a conversation about science. It’s silly. Areta JL, Burke LM, Ross ML, Camera DM, West DW, Broad EM, Jeacocke NA, Moore DR, Stellingwerff T, Phillips SM, et al: Timing and distribution of protein ingestion during prolonged recovery from resistance exercise alters myofibrillar protein synthesis. J Physiol 2013, 591:2319-2331. Please don’t misunderstand, my point was never about a lack of emphasis on total nutrient intake. As you said, that was mentioned. It’s that there is, in an opinion I formed due to research, undue emphasis placed on avoiding catabolism throughout the day. As I said, I think it’s fine to spread protein intake out across the day via snacks and shakes because, again, not everyone can handle just making every meal bigger. Still, I’m not sure I buy the graph depicting the swimmer skyrocketing above and then plummeting below the displayed anabolic threshold if he doesn’t get his protein every two hours. Perhaps I should have been more clear in my initial comment: I do not think it’s a good decision to only eat one giant meal per day. In that rather extreme context, I would have to agree that timing of nutrient intake is important. I’m simply trying to say that a diet of adequate total protein and calorie content in the format of his current eating schedule should keep that poor swimmer from wasting away. I think that snacks like nuts or protein bars and protein shakes are a great way to achieve those total nutrition requirements without swimmers feeling like they have to gorge themselves on food at every meal. A fasted swim practice would obviously not be good (although there are a handful of studies suggesting some performance benefits of fasted exercise sessions, but I do believe that it’s generally better to train fueled so no argument here from me), I’m all for pre-practice snacks if a meal was a long time before. Blood sugar levels are important. However, I don’t think that means you need to load up every two or three hours leading up to that. I actually brought up the Christian Bale story to support a point it sounds like we’re both in agreement with: Shoveling a ton of food in your face all at once would be awful, so why not space out the intake? In no way was that intended to be a scientific claim, just a statement of personal preference regarding the volume of my meals. With that, I’m not too worried about being “that guy.” I apologize if my use of the phrase “I think it sounds miserable” struck you as an attempt at proving any kind of objective or absolute point. I’ll acknowledge that there are studies that show a positive result of certain protein timing protocols over others. We both know that there are others that show no effect. I will trust the meta-analysis over the study with a sample size of 24. Hopefully more conclusive research comes out in the future. So my question for you is this: How long does it take a body to enter a catabolic state? If I hit the recommended macronutrients for my age, size, activity level, etc. and stop eating at noon on Monday, how long do I have before my body starts to break down muscle? I apologize for resorting to sarcasm in this post, and I respect the hard work and study you’ve undertaken on your path, but I have trouble believing the human body would thrive through thousands of years of hunter-gatherer diets if it started cannibalizing after 3 hours. He is having an anabolic response for only a short period of time because he is getting inadequate protein intake. In the first example he only had 15g of protein for lunch. It is pretty common knowledge that 15g of protein only gives an anabolic response for a short period of time. After a large meal such as 40-50g, the anabolic response would have lasted longer. You may not buy it, but it is well documented that the anabolic response from a meal can only lasts so long, regardless of if blood amino acid levels are still elevated. your comment, “undue emphasis placed on avoiding catabolism throughout the day.” is tough to agree with. Avoiding catabolism is the whole point of eating and getting adequate calorie intake. Are you sure you know what catabolism means? Sorry, I overreacted in my last post. In my first comment I tried hard to be constructive and non-confrontational while trying to find a middle ground. I felt that your response to that had put some words in my mouth (the Christian Bale bit, for example), and so I dug my heels in and got snippy. It was immature of me to escalate it that way. You’re clearly more qualified and educated on this subject, I can’t find any good reasons to disagree with the evidence and logic you’re presenting, and so I’ll defer to your expertise.